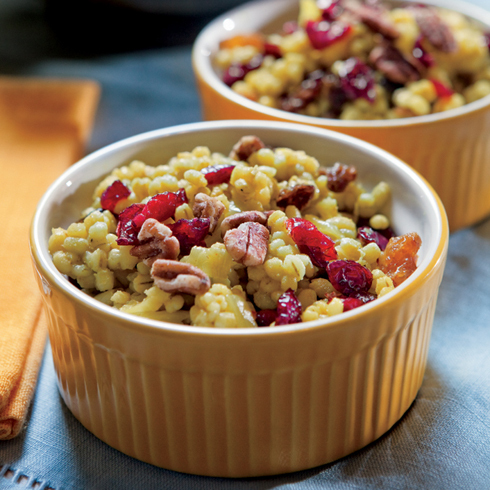 …When I stumbled across this recipe from Farmflavor: Curried Barley with Cranberries, Raisins and Pecans by Kim Galeaz. This is a delicious recipe and I can honestly say I now have a deep love affair with barley, particularly with the warmth of curry, turmeric, and allspice, the sweetness of dried fruits, and the savory crunch of nuts. I am always a lover of the combination of sweet and savory and the addition of curry truly brings together a harmonious blending of the flavors in this dish. The other beauty of this recipe is its versatility. Not only is it good warm as the recipe instructs, it is also delicious at room temperature. Adding different dried fruits and nuts, as well as fresh fruits (just before eating I added 1/2 of a granny smith apple), keeps this recipe from becoming boring and gives you a very nutritious , and delicious, way to start your day!